Welcome to Tuesday Poetics at the DVerse bar, converted tonight into a 19th Century salon. I’m Sarah, and I’m your hostess for the evening. Imagine, if you will, that you are a Victorian belle. That’s it, lovely. Smooth down your skirts and sit up straight. If that’s too much of a stretch, maybe you could imagine that you are a Victorian beau. Stroke your beard. Sit up straight. Excellent. Sitting up straight is so important. Now, let’s talk about how you belles and beaux communicate. No Facebook, with its cheeky likes; no Instagram; no Snapchat and definitely no texting. You could write, but perhaps Mama hasn’t given you permission to receive letters. Perhaps Papa reads everything that enters or leaves the house. sometimes on a sunny day it began even to be pleasant and genial, and a greenness grew over those brown beds, which, freshening daily, suggested the thought that Hope traversed them at night, and left each morning brighter traces of her steps. Flowers peeped out amongst the leaves; snow-drops, crocuses, purple auriculas, and golden-eyed pansies. On Thursday afternoons (half-holidays) we now took walks, and found still sweeter flowers opening by the wayside, under the hedges. obviously she’s talking about hope, modesty, cheerfulness, and the link between money and happiness. 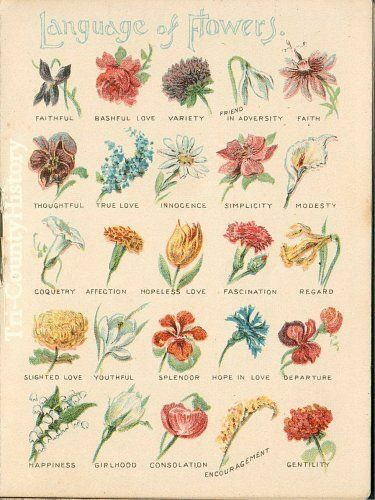 Once you know about this secret language, you can look at many pieces of 19th century art and try and work out the flower references. The pre-Raphaelites seem to have been particularly keen on all of this. Spot the poppies? and the foxgloves? Rossetti is telling us that Lilith is one dodgy lady. We still have remnants of all this today. You can read about the symbolism of Kate Middleton’s bouquet here: https://www.onefabday.com/royal-wedding-bouquet/. 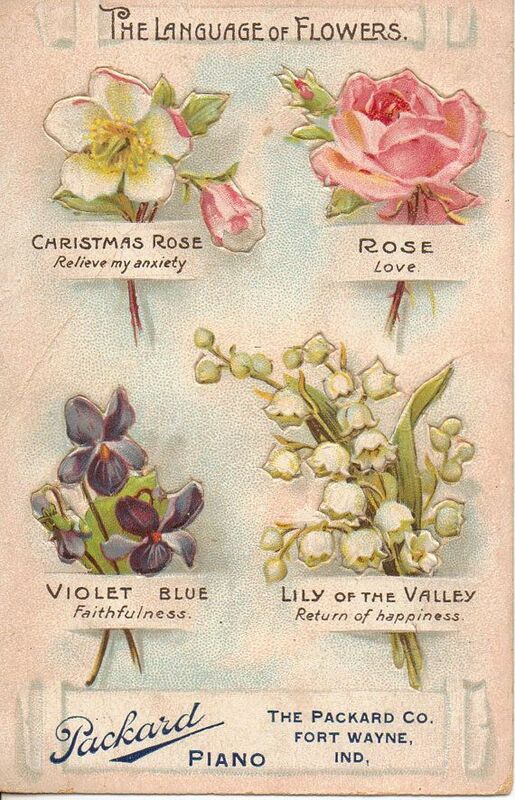 There’s a reason why brides wear orange blossom (“woman’s worth”), and why we give red roses on Valentine’s Day (love). And everybody knows that white heather is for luck. This has been a massive preamble, but now we get to the meat of it all. What I want you to do is to write a poem that uses a flower, and the meaning of that flower. You can use a whole bouquet of flowers if you want, or a single bloom. Witch hazel – a spell. Once you’ve written your poem, link it up to Mr Linky (don’t forget to press that extra button), then sit back, check out the other poets, and comment on their work. We all love the dVerse community, and we are the ones who make it what it is. Hello all, what a fun prompt. So much that can be said on this… I have to say another poem I remembered is this one by Emily Dickinson… and the attar of the rose, and the ceaseless rosemary.. Thanks for hosting, Sarah! I added one about daisies and innocence. You’re very welcome. Looking forward to reading! Thank you to everyone who has posted so far! I’m off to be now, but I’ll be reading again tomorrow. Sorryyyyy! Ai am not that good in English, you know. Maybe aI should have an English or American au pair. So enjoy this, Sarah. Hope I can come up with something. Is there a flower for a comatose muse? Thank you, Sarah, for hosting this delightful Victorian garden party! My mother often reminded me to “Stand up straight” and “sit like a lady” 🙂 I had fun writing love notes between a beau & belle. Thanks for joining in. I enjoyed writing this prompt, and I’ve really enjoyed the poetry it produced! You are very welcome here! DVerse is a lovely poetry community. I hope you enjoy it here. Thanks for a great prompt Sarah. Adding mine soon! Thank you. Check out dVerse regularly for prompts!